Stedelijk Museum Bureau Amsterdam presents The Jinn, a powerful and elaborately constructed new body of painted, drawn and animated work by Tala Madani. Arab folklore and Islamic teachings depict the jinn as mythological creatures with magical powers who occupy a world next to our own, in which they intervene without restraint. By tracing the potential intrigues of these demons, Madani scrutinizes human obsessive behaviour and then skilfully sketches her observations – distinctly peppered with a dose of fantasy – upon canvases and sheets of paper. Madani’s work is characterized by an illustrative stroke of the brush, moving back and forth across the borderline between the clear-cut line of comic strips and an expressionist use of color. Her energetic compositions situate her figures in absurd scenes touching upon the non-rational aspects of human behavior. Many of Madani’s compositions are constructed as if taken by surveillance mechanisms, or candid cameras, which the figures depicted are conscious of, but ignore. 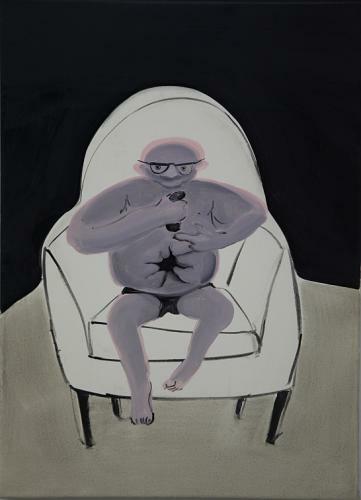 Against the background of intimate, domestic or dreamlike environments, the unambiguously male figures expose themselves freely and easily to observers. Apparently obsessed, they are completely immersed in the demonic scope of their activities. And invite the observer to enjoy these activities, too. Through taking the idea of the demonic obsession as a point of departure for her works assembled in the SMBA, Madani has added a mythological element to her artistic practice. While a fascination for the non-rational has always driven her artistic production, the explicit involvement with Islamic tradition and Arab folklore enriches her practice in a fresh and intriguing way. ‘Tala Madani – The Jinn’ is accompanied by the bilingual SMBA Newsletter No. 125, which includes an essay by Kerstin Winking, curator of the exhibition, who relates Madani’s interest in non-rational aspects of human behavior to political debates and a popular television series. In addition, SMBA Newsletter No. 125 contains a Project ‘1975’ contribution on the exclusion of artists working on African ground from the global art world, written by the Ghanaian artist and writer Rikki Wemega-Kwawu. Tala Madani (Iran, 1981) lives and works in Amsterdam and New York. After receiving her MFA from Yale University School of Art in 2006, she was awarded the Kees Verwey Fellowship and was artist in residence at the Rijksakademie van beeldende kunsten, Amsterdam in 2007. Recent exhibitions of her work include ‘He Disappeared into Complete Silence’, De Hallen, Haarlem (2011), ‘Speech Matters’, Venice Biennale (2011), ‘Greater New York’, MoMA PS1 (2010), 4th Tirana International Contemporary Art Biennial (2009), ‘Younger than Jesus’, New Museum, New York (2009), ‘Dazzle Men’, Pilar Corrias Gallery, London (2009). Rikki Wemega-Kwawu (Ghana, 1959) lives and works as an artist and writer in Takoradi, Ghana. He is an alumnus of the Skowhegan School of Painting and Sculpture, Maine, U.S.A. In 2008 he was an Adjunct Professor in Art at the New York University - Accra, Ghana Campus, where he taught Post-Colonial Studio Practices. Project ‘1975’ and the exhibition ‘Tala Madani - The Jinn’ are made possible with support by the Magic of Persia, the Prins Bernhard Cultuurfonds, the Mondriaan Foundation and the Amsterdam Fund of Arts.